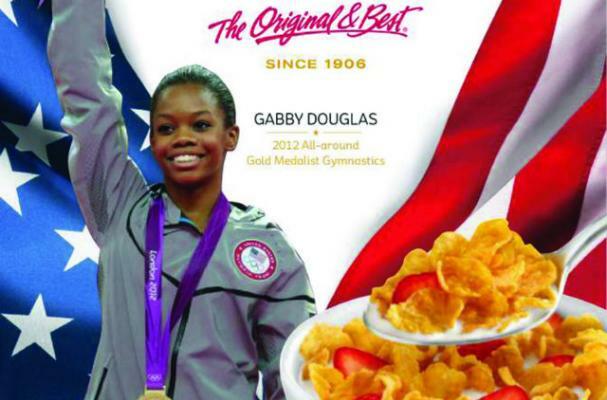 Olympic gold medal gymnast Gabrielle "Gabby" Douglas is the latest athlete to get her face on a cereal box. The 16-year-old has just signed an endorsement deal with Kelloggs' Corn Flakes for $1.3 million. "New Olympic champion @GabrielleDoug to be on @Kelloggs_US Corn Flakes boxes this fall," USA Gymnastics wrote on Twitter. Douglas won a gold medal in the women's individual all-around competition at the London 2012 Olympics. She is the first African-American and non-Caucasian female to win the all-around competition.